Seven River Prayers is a hand-sewn and side-bound letterpress chapbook in a limited edition of 70 copies. Hand-set in Bembo cast in by the Bixler Press & Letterfoundry (Skaneateles, NY), and letterpress printed on a Challenge Proof Press. The mesmerising flow of the marble is a delight and makes each chapbook unique. The stock is sublime, with exquisite Okawara Handmade from Japan, interleaved with hand-marbled Momi Chrysocolla paper from Thailand. I contacted Emily to learn more about this arresting production. What qualities were you looking for in the paper stocks? And how did the Momi Chrysocolla and Okawara meet or exceed your expectations? I tested several paper possibilities in the initial stages of the project, and realized that a strong, thinner Asian style paper would best reflect the strength and clarity of water, which is the abiding subject of Seven River Prayers. I had a chat with Matthew Eickhoff of Dolphin Papers (Indiana), my go-to paper suppliers, and he suggested that the Japanese Okawara Handmade might fit the bill. He was right. 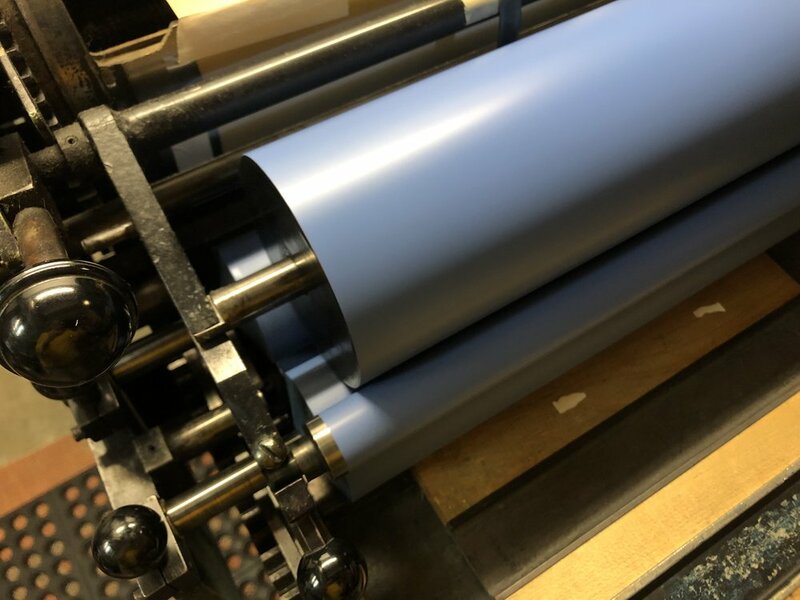 At about 60gsm, this 100% Kozo sheet has just the right combination of translucence and yet cushiness for letterpress printing, plus a wonderful light texture. It exceeded my expectations, including in how finely it prints. 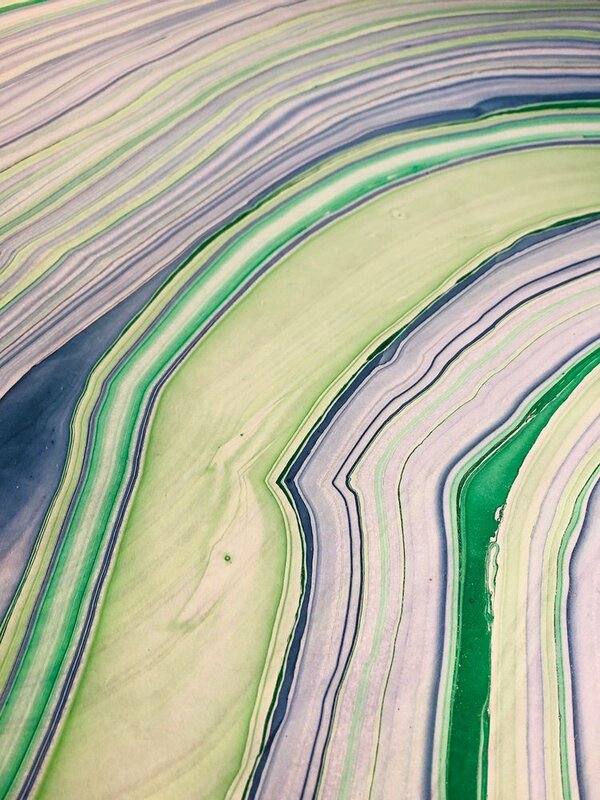 The Momi Chrysocolla was pure serendipity—I spied it while scrolling through Dolphin Papers’ website, and immediately resonated with the flowing, watery lines of this hand-marbled paper from Thailand. It was the perfect decorative sheet to interleave the text of Seven River Prayers. Also I am super jealous of your Bembo - it is one of my favourite fonts and I don’t yet have any in metal - why did you choose this face for Seven River Prayers? Were the sorts freshly cast by bixler for this project? if so what did the commission or purchase process look like? I love Bembo, as well. It is a superb typeface for book work: classic and elegant, confident and gentle, all at the same time. It has become my preferred face for setting poetry, and some years ago I began slowly acquiring as much as I could afford in metal. Michael and Winifred Bixler (New York State) are outstanding casters and printers. The type I get from them is consistently excellent, expertly finished. I have a good amount of 14-point Bembo Roman on hand from them, my preferred size for poetry, and used that for the text of Seven River Prayers. One of the fun typographic challenges was figuring out how to “title” the poems. They are excerpted from a larger series, and the poet, Michael Delp, wondered if these seven could benefit from having titles. It seemed to me that the first phrase of each poem was it’s own lovely heading, and, with a little typographic play in 24pt Bembo Italic, I designed a way to highlight the beginning of each piece while, I hope, maintaining the flow of the whole. As you know I think the book and its gorgeous, its flowing marbled ink instantly captured my heart… and the quality of type and paper is all first class! What other feedback/response have you had to this project? Well, the poet is very happy with his book, so everything beyond that is gravy for me! Several folks have commented how it seems they are walking or swimming the river as they read the poems—that is the feel I was hoping for, to invite the reader to flow with Delp’s language, the moving waters of words and meanings and images. St Brigid Press is a letterpress print shop in the Blue Ridge Mountains of central Virginia. Emily Hancock is proprietor and printer. Emily Hancock has been reading and writing poetry since she was in elementary school, and worked as a bookseller for Stone Soup Books and Cafe in Waynesboro, Virginia for 6 years. In the Autumn of 2011, that life-long love of classic and contemporary literature began to discover its unique expression through the handcrafts of traditional letterpress printing and bookbinding. Newer:A coffee table book celebrating women in the type industry, published by People of Print (in perpetuum), authored by Amber Weaver.Older:Dan Milne's Tasman, a sturdy, warm type family that is neither mechanical nor fragile.